We left Napier and headed inland climbing and climbing through beautiful mountains with odd-shaped hills, all kinds of farms and timberlands, and lots of mist and rain. 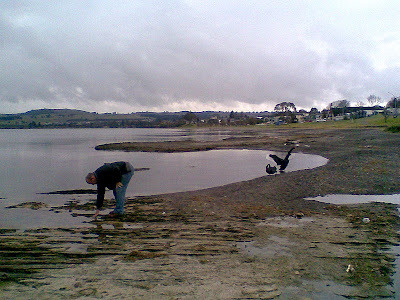 We got to Taupo, and Lake Taupo. Nice little spot. 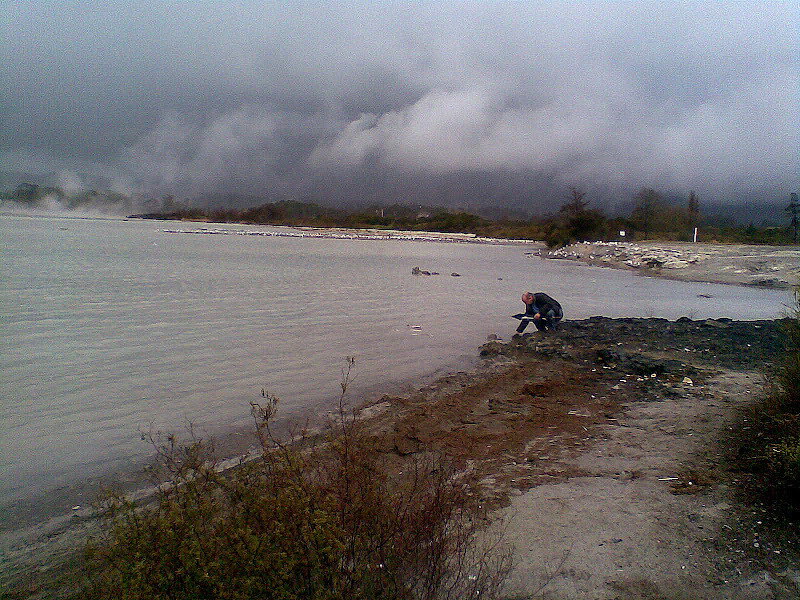 We noticed that the lake was steaming - yep, there were some little hot springs by the edge of the lake, but the lake itself seemed to be quite cold. As we drove out of Taupo, on to Rotorua, we came across a little place advertising "Craters of the Moon", so we paid a minimal amount to wander through. Hmm ... lots of random steam coming out of the ground, and warning signs galore. Even some sizable holes in the ground, with interesting bubbling sounds coming from down there. 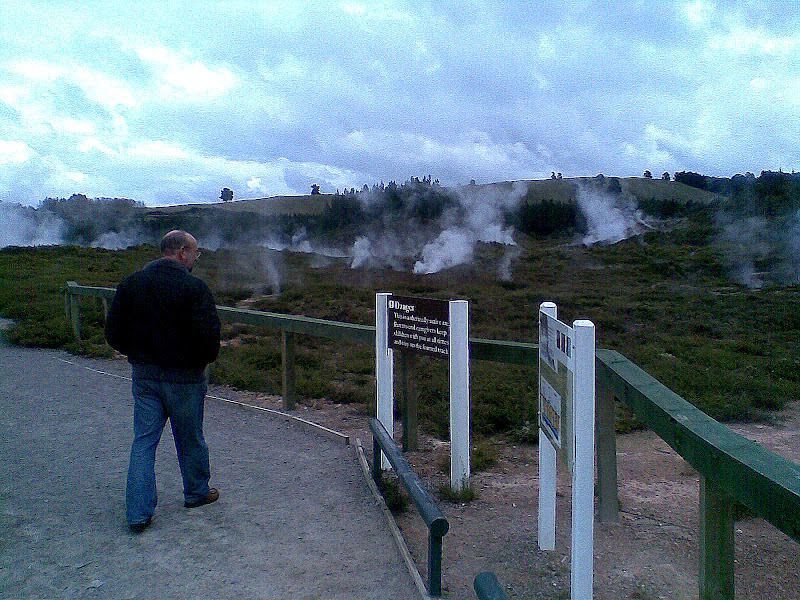 And so on we went to Rotorua. We saw more (and bigger) random steam pouring out of the ground in the bush, and even went past the geothermal power station. 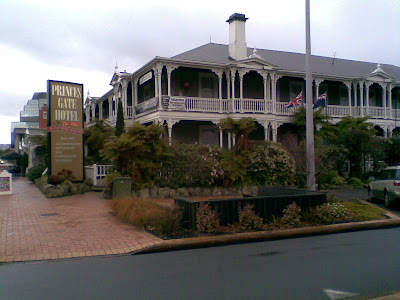 In Rotorua we stayed at the Princes Gate - a "Historic Boutique" hotel. 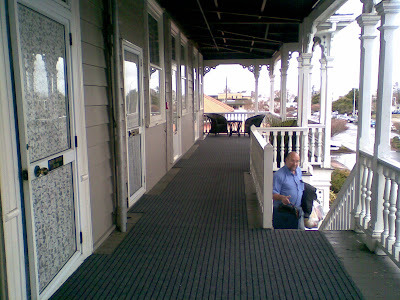 Our room (like all of them, as far as I could tell) opened onto the verandah, and the rooms had names of (presumably famous) people instead of numbers. ... the sulphur smells from which seemed to waft through our room all through the night! Of course, these hot, smelly lakes have their own advantages. There are lots of hot pools and spas you can pay to float around in - the hotel has its own little three-level pool. At the top (on the right) is a little pool that was so hot we could barely dip our hands ... that trickles over into the middle one where I am sitting - hot enough to leave your skin lobster-red. (Can't stay in there too long.) Then that trickles over into the big lower pool which is just lovely and warm. New Zealand does not boast much wildlife. Almost everything (other than the Kiwi) is introduced. Being from WA, where we don't have sparrows, we enjoyed the local attendants at al fresco restaurants .... waiting for a few crumbs of pie-crust. We attended one of the (compulsory :)) "Hangi and Concert" deals at the local Maori village. (We went to the Mitai one.) It was fun. We were picked up by a shuttle bus that went to all the the hotels where people had booked. 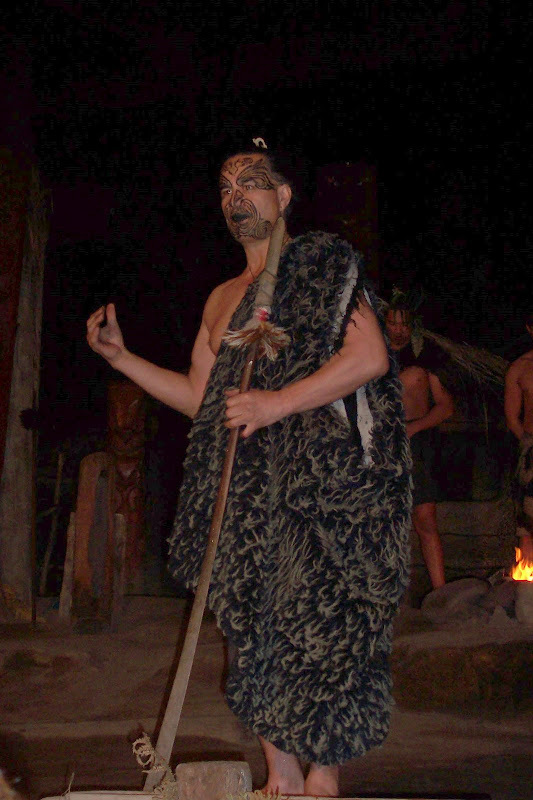 A Maori chap, MC-ed the do, and amused everyone by managing a word or two in each of the 18 languages represented by the people attending the night, as he explained a little of the Maori culture. Then he unveiled the Hangi that had been cooking for the last three hours. (We were a little disappointed with the look of all this after many delicious hangi-style meals on Murray Island.) Where are the banana leaves and stuff? Well, it tasted good and smokey as a hangi should. Meanwhile we went for a walk alongside the delightful spring with rainbrow trout (introduced from America) and eels clearly visible meandering in the clear water. A canoe-load of warriors came down the stream. They went back and forth a few times to give everyone a chance to take picks. and explained something of the ancient culture. Finally, after our huge meal, we had a little wander through the bush to find glow-worms along the banks of the stream. "Craters of the Moon" had been a bit of a "damp squib", we soon realised as we went to see the thermal wonderland at Wai-O-Tapu. Lots of pools, and bubbles, and smells, and different colours of mud. I found the place steamy hot, despite the rain and drizzle. The pool I'm by here is very deep and at a temp about 150 degrees - not a place for swimming. This "Devil's Pool" is a brilliant green colour - quite startling. Next:- a day in Aukland ... and then on a plane to Fiji. The way the weather here is turning, we will need our few days in Fiji to dry out a bit.